Activists Accuse Israel Of Cracking Down On Dissent Three recent cases have put the spotlight on how Israel deals with a growing protest movement. A Jewish Israeli was sentenced to three months in prison for participating in a peaceful bicycle demonstration. An arcane law is being used to remove a Palestinian activist from his Jerusalem home. And this weekend, a Palestinian died after inhaling tear gas dispersed by Israeli forces at a demonstration. Nearly 200 people demonstrate in Tel Aviv on Saturday. Jawaher Abu Rahmah, a 36-year-old Palestinian woman, died overnight after being tear gassed by Israeli troops at a West Bank protest. People file into a small concrete house in the West Bank village of Bilin, kiss cheeks and offer condolences to women in mourning sitting in plastic chairs. Soubhiya Abu Rahmah is a stout woman dressed in a traditional Palestinian robe embroidered with cross-stitching. The face of her son, who was killed during a demonstration in 2009, appears in posters papering the otherwise bare walls. 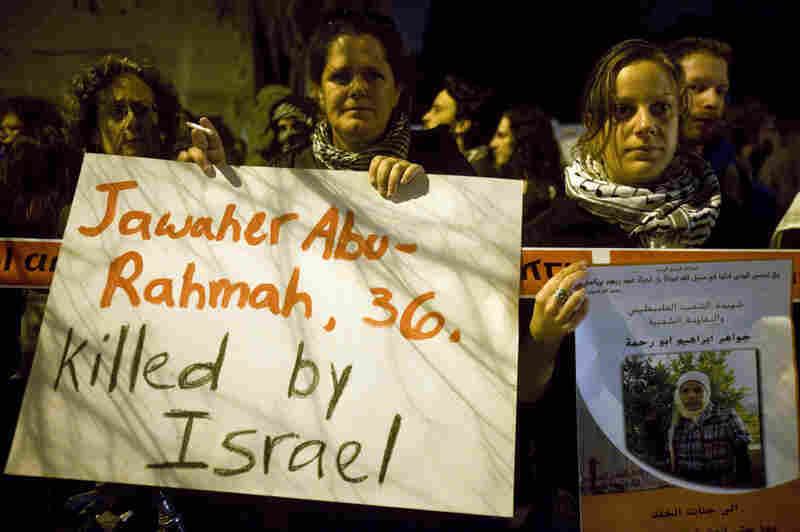 Now her daughter, Jawaher Abu Rahmah, has also died after attending a similar demonstration Friday. "My daughter started talking to me, screaming and saying, 'I feel bad, I feel bad,' then she started throwing up," Abu Rahmah says. "We took her to the hospital, and we found that the tear gas had gone totally into her lungs." Abu Rahmah blames the Israeli military for her daughter's death. Palestinian doctors support that claim, saying she died of a heart attack after breathing in too much gas. An investigation is under way, but Israeli press reports say the military believes Jawaher died from other factors. Unnamed Israeli officers are quoted as saying the Palestinians are trying to use the young woman's death to discredit the army. There will be a debate about the incident Wednesday in Israel's parliament, the Knesset. The Israel Defense Forces declined to go on the record about the investigation. Speaking to NPR by phone, right-wing Knesset member Danny Dannon, who belongs to the security committee, says the Palestinians are cynically trying to manipulate the case. "What we see today is that they think that by bullying us in the international arena we will make more concessions, and that is not the case," he says, "especially not with this government." In fact, he says, Israel encourages peaceful protesting. "I don't know any other neighbor of Israel where you can go and protest. But when the demonstration becomes an assault -- and it happens sometimes in the West Bank -- that's when we have to take action," he says. "And when our soldiers are under threat, they have to protect themselves." But human rights groups and activists say a series of recent cases shows that Israel is systematically cracking down on dissent. "My case is only one of many cases, one that gets attention because I'm a Jewish Israeli," says Jonathan Pollack, one of the leading pro-Palestinian activists in Israel. In 2008, Pollack was participating in a peaceful bicycle protest in Tel Aviv when he was arrested, the only person arrested during the demonstration. Last month, he was convicted of disturbing the peace and was sentenced to three months in prison. He says Israel is targeting protest leaders who challenge the occupation of the West Bank, while rabbis who break the law by preaching discrimination are unsanctioned. "I think that I can be sent to jail for three months for protesting the siege of Gaza, while open racism [that] is advocated in Israeli society [goes] unanswered," he said. Another case that is garnering attention is that of grass-roots organizer Adnan Ghaith, who is from the east Jerusalem neighborhood of Silwan. Using an arcane law that dates back to the British mandate before the birth of Israel, officials told Ghaith he was to be banished from his home for several months on the basis of secret evidence that his defense lawyer was not allowed to see. He told NPR he won't obey the deportation order. Pollack says protest movements are a vital outlet for the many tensions here. "I do think that popular resistance and grass-roots organizing are one of the only alternatives to horrible violence in this region," he says. "And I think that it is in the interests of everyone that this sort of resistance prevail." He warns that if Israel is allowed to repress the movement of civil resistance, there is no doubt that other more brutal forms of resistance will arise.